On 28 June 2016, the Deputy First Minister and Cabinet Secretary for Education and Skills published the ‘Delivering Excellence and Equity in Scottish Education – A Delivery Plan for Scotland’. The Delivery Plan outlines the steps the Scottish Government will take to achieve key improvements in education, building on the work contained in the National Improvement Framework and addressing the recommendations of the OECD review. A key action within this Delivery Plan is for Education Scotland to publish Benchmarks for Assessment for all curriculum areas by Christmas 2016. These were to build on the Benchmarks that have already been published for Literacy, Mathematics and Numeracy. The Benchmarks set out clear statements about what learners need to know and be able to do to achieve a level, from Early to Fourth Level. They streamline and embed a range of existing assessment guidance to provide a single key resource to support teachers’ professional judgement. The Benchmarks should be used to help monitor progress towards achievement of a level and to support professional dialogue and judgement of when a learner has achieved a level. Education Scotland has prepared draft Benchmarks for Sciences with the generous support of a cross-sectoral practitioner working group. 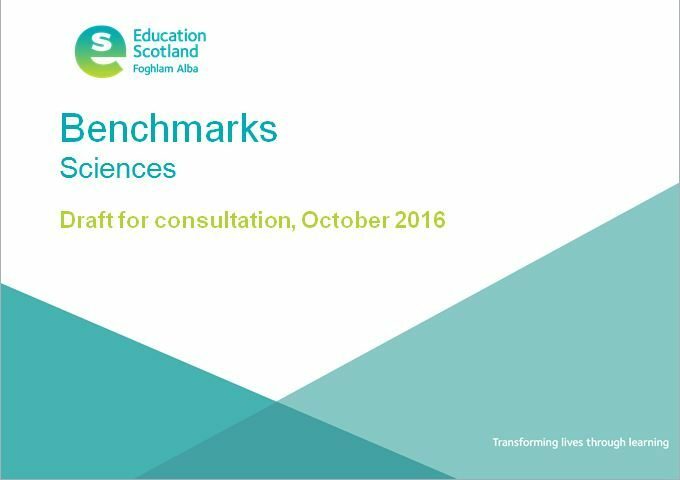 Practitioners across Scotland were given the opportunity to provide initial feedback on these benchmarks in October. This initial period of consultation has now closed and the benchmarks are being reviewed in light of the valuable feedback received. The revised version of the sciences benchmarks will be published in December 2017. Following the publication, an extended period of consultation will begin. This will give practitioners a period of time to review the Benchmarks within their settings and identify refinements that need to be made. Education Scotland will gather comments on an on-going basis throughout this period.